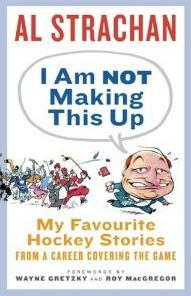 Al Strachan, who suddenly found himself with a lot of free time during the 2009-10 season, is releasing a new book called I Am Not Making This Up: My Favorite Hockey Stories. This should be good. For a guy with a terrible reputation for thinking up the most absurd rumors in hockey, that is quite the loaded title! You can probably sense the rolling of my eyes as I typed this. I confess - I am not a fan of Al Strachan. I think he's a weaselly, beady-eyed fink who contributes a whole lot of nothing to the world of hockey prose, let alone journalism. That being said, I quite enjoyed his new book I Am Not Making This Up: My Favorite Hockey Stories. Strach copies the wildly successful format he used when writing Don Cherry's Hockey Stories And Stuff, just telling stories in no particular order, as if you are sitting around a table at your favorite sports bar just listening to him tell his stories. There is not a lot of literary genius here, but there is entertainment value. The stories he tells in this book - made up or not - are fun, quick reads. They are not as well written or entertaining as James Duthie's new book The Day I (Almost) Killed Two Gretzkys, which sets the new standard for these types of books. But Strachan surprises with a fun read, with only a few of the unnecessary pot shots at the CBC and Brian Burke that he is famous for. I guess any commentary from Strachan without the expected slander of Burke would disappoint, but it refreshing for Strachan to more-or-less stay away from that. For all his enemies he's created in hockey, Strach remains a very well connected man. The fact that Wayne Gretzky and Roy MacGregor - two of the best in the world at what they do - both wrote forewords for Strachan's book attests to that. That also allows access for Strachan to acquire these great, behind-the-scenes stories. Lou Lamoreillo refusing to allow 42 year old Igor Larionov to have a glass of wine with dinner. Harry Neale's unconventional motivational speech. He borrowed a policeman's gun and threatened to shoot his players if they didn't smarten up. Baseball star Pete Rose bought the engine from the Porsche that Pelle Lindbergh smashed up while drinking and driving, leading to his death. So whatever you think of Al Strachan, don't immediately dismiss this book. It has some entertainment value in it, if only as a bathroom reader. Then again, maybe I only say all of this because I don't have to watch or listen to Strachan tells these stories. Bestselling author and Toronto Sun sportswriter Al Strachan is a fixture in the hockey world. His hockey insight is read and enjoyed by fans from coast to coast and all across North America. He is well liked and respected by players and coaches and often is given special privileges due to a personal relationship he shares with a hockey insider that allows him the scoop on a breaking story. Strachan knows hockey and has been writing about it for almost forty years. He has been witness to the most exciting, most controversial, and most talked about episodes in hockey. He has been there for all the action and he has established relationships with the biggest names in the game from every generation and era. In his latest adventure, he revives tales from the rink that will fascinate, horrify, and entertain fans of the game. From sharing a beer and candid conversation with Gretzky to humor, never-before-revealed stories about Ken Dryden, Strachan’s book will deliver one enjoyable tale after another. As if Joe Pelletier ever contributed anything memorable to the world of hockey journalism.